The movement of nutrients between habitats can greatly alter primary productivity in the recipient habitat, leading to trophic cascades and alterations of the community of consumers. Two specific cases are presented here: the Aeolian movement of nutrients from the African continent to the Amazon rainforest, and the input of marine-derived ornithogenic guano to island ecosystems in Baja California, Mexico. The Amazon rainforest is a relatively nutrient-poor habitat, and the nutrient budget there is heavily subsidized through wind-blown deposition of sediments originating in Africa (Figure 1). 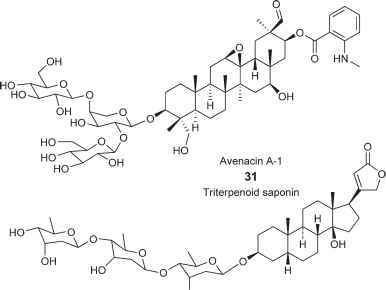 This nutrient subsidy from over 5000 km away and across a vast ocean deposits as much as 13 million tons of phosphorus per year in the Amazon Basin, and is responsible for much of the primary production in the recipient habitat. This increase in production, driven by abiotic mechanisms (wind) and occurring over vast spatial and temporal scales, has cascading effects throughout the rainforest ecosystem. 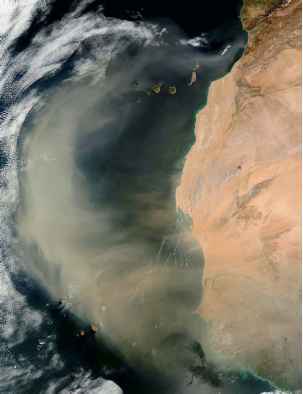 Figure 1 Wind driving dust off the west coast of Africa. These dust storms can transport nutrients, sediment, and organic materials across thousands of kilometers of land and ocean, with dramatic effects for these distant subsidized habitats. Photo courtesy of NASA. 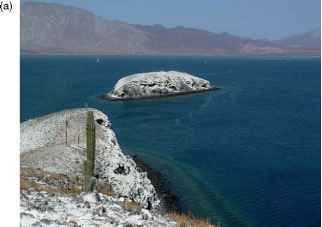 Figure 2 (a) The Gemelitos islands in the archipelago of Bahia de los Angeles, Baja California, Mexico. The high levels of marine-derived nutrients deposited on the islands by seabirds represent a subsidy to the terrestrial and intertidal systems, with dramatic effects on recipient communities. (b) A schematic food web for these small islands, showing the importance of marine subsidy. Redrawn from PolisGAand Hurd SD (1995) Extraordinarily high spider densities on islands: Flow of energy from the marine to terrestrial food webs and the absence of predation. Proceedings of the National Academy of Sciences of the United States of America 92: 4382-4386; copyright (1995) National Academy of Sciences, USA. abundance of marine-derived nutrients allows those islands frequented by seabirds to have tremendous increases in plant growth relative to those islands less frequented by birds. This biotically mediated nutrient subsidy not only alters the composition and stability of the plant community, but the periodic pulse of production in turn alters the abundance, diversity, and composition of the island arthropod and in turn songbird communities, with effects that last well beyond the occasional wet year. There are numerous other examples of nutrients being transported between ecosystems with dramatic effects for the recipient habitats. In the Galapagos, sea lions transport marine nutrients onshore, affecting primary productivity on beaches; in riverine systems, upstream habitats represent a source of nutrients, and downstream ones a sink; upwelling transports deep oceanic nutrients upward into the surface zone, where they can fuel plankton blooms; salmon transport marine nutrients to the rivers, where they die and are taken up by the local plants and algae, fuelling both the aquatic and terrestrial food webs. It is worth noting that humans mediate a number of these spatial subsidies - for example, anthropogenic nutrient inputs have dramatic effects on near-shore habitats in many areas, leading to shifts in plant and animal communities and occasionally eutrophication.